Amara Singapore brings in the Christmas cheers and New Year’s festivities with a whole host of dining and party options. For a great feasting, reserve your seats as early as 17 November 2017 and by 1 December 2017, to enjoy 1-for-1 Christmas Eve and Day, New Year’s Eve and Day buffet spreads at Element restaurant, limited to the first 20 diners, per buffet session, per day. Highlights for the Festive Starters are: Tuna Tataki with Cucumber Ribbons and Puffed Quinoa; cold cuts of: Parma Ham, Salami and Smoked Duck Breast; Cocktail Prawn and Crab Meat in Duo Melon; Marinated Duck Rillette with Red Wine Dried Fruits Chutney and Gherkin Salsa; and Honey Baked Butter Squash with Honey Mustard and Pumpkin Seed. Honey Baked Butter Squash with Honey Mustard and Pumpkin Seed. The tuna tataki is light and delightful. Nicely seared to medium rare, you can enjoy duo texture of the slightly cooked part. There is a touch of tanginess in the dressing to remove any fishy flavour in the fish. The best part of the cold cuts is the Parma Ham. One of my favourite cold cuts and nicely paired with the melon from the cocktail prawn and crab. Cocktail Prawn and Crab are simply tossed in mayonnaise. A simple dish, however, it showcases the freshness of the ingredients. 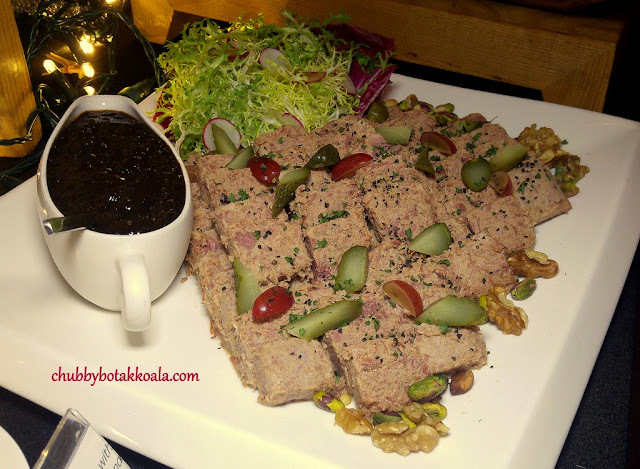 Marinated Duck Rillette is fatty and rich served with red wine chutney. There is no French Loaf, bread roll or crackers, during the tasting but I will definitely prefer to have rillette with some of these. 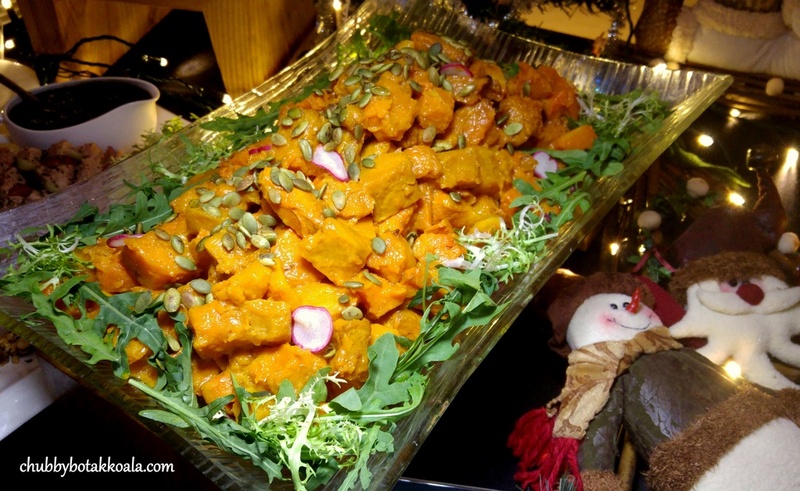 Honey Baked Butter Squash with Honey Mustard and Pumpkin Seed is sweet and appetizing. Cognac Lobster Bisque is creamy and robust. It can do with a few shreds of lobster meat just to elevate the dish further. 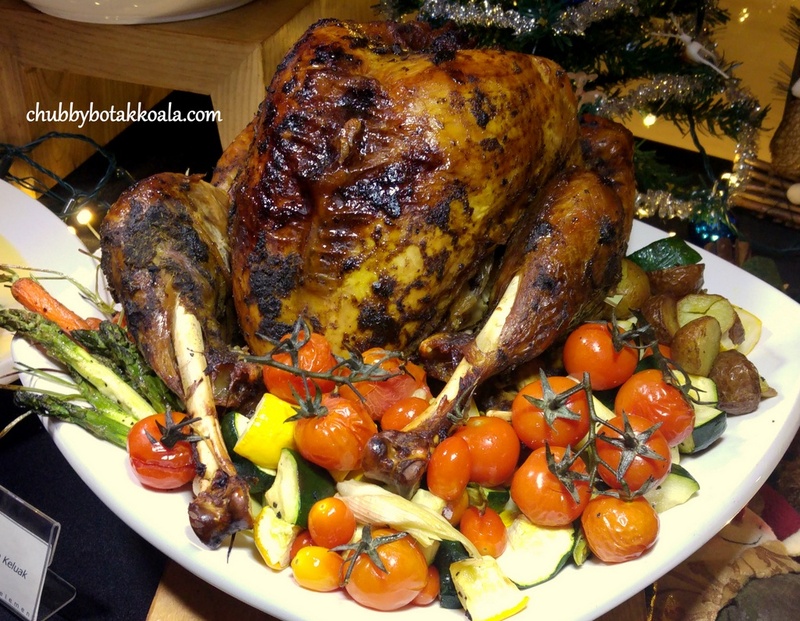 Festive Mains includes Turkey Buah Keluak; Stir-fried Moreton Bay Bugs with Salted Egg; Tajima Wagyu Beef with Foie Gras with Port Jus; and Roasted Chicken with Meat Floss. Turkey Buah Keluak, the infusion of “Peranakan Truffle” into Christmas Tradition. You can taste the buah keluak flavour in the breast part and also the skin part of the turkey. According to the Chef, it took them three days to prepare the turkey. You can definitely feel the effort they put in preparing the turkey. Stir-fried Moreton Bay Bugs with Salted Egg. Still one of the most popular stir-fried dish in a Chinese restaurant in Singapore. The Moreton Bay Bugs meat is chewier than prawn, so you have to chew it more and salted egg flavour will linger longer in your mouth. My personal pick for main dish on the night is the Tajima Wagyu Beef. Cooked to medium and basked in Port Juice. It is not the melt in your mouth type of beef, but you definitely will enjoy the succulent, meaty beef here. 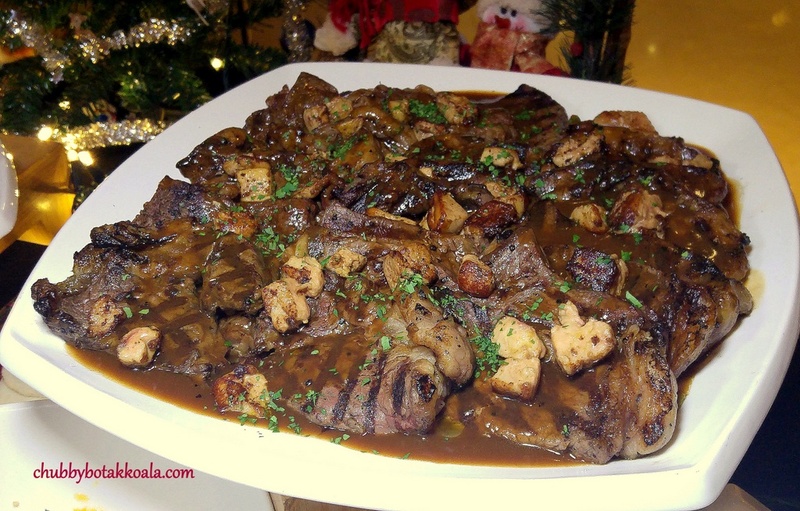 There are cubes of foie gras on top that added to the richness of the beef. Festive dinner will not be complete without Log Cakes. 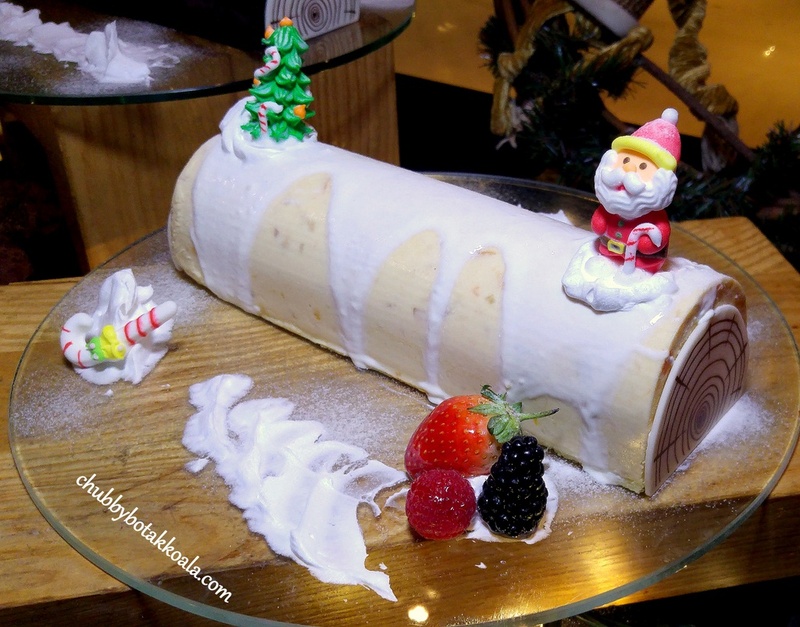 The Amara's Signature Chempedak Yule Log Cake is a must try. It has a nice, sweet, strong pungent jack fruit flavour to go with the moist roll. Yum Yum. 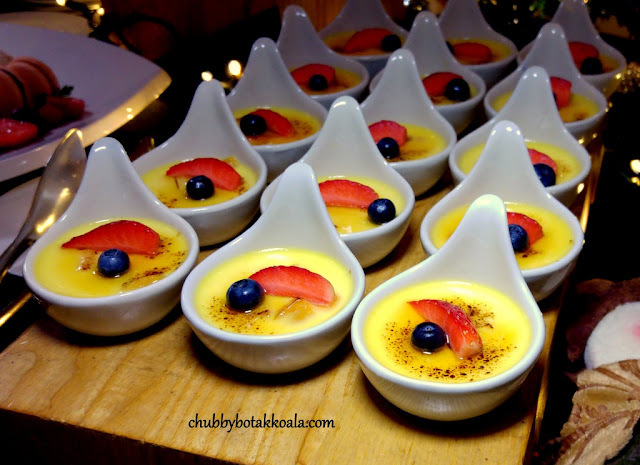 Keep a look out for the Chempedak Creme Brulee that is delicious as well. 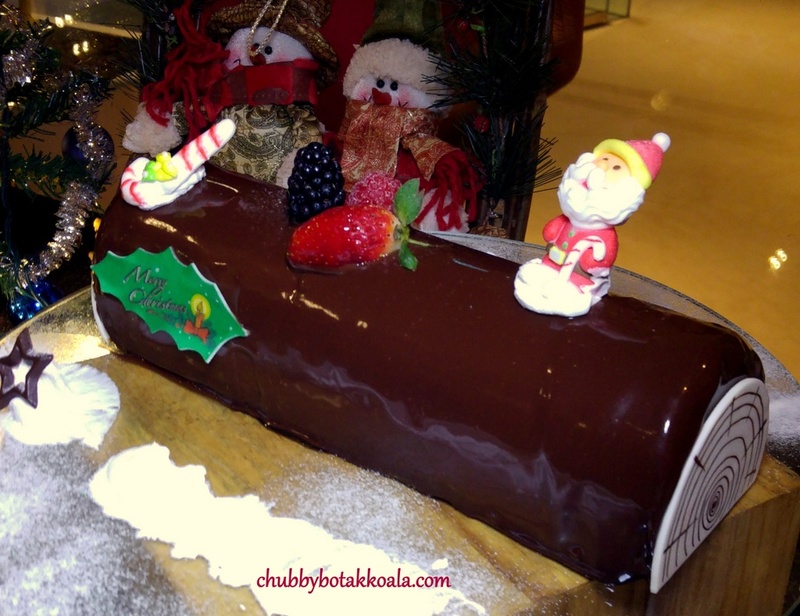 The Dark Chocolate Cherry Yule Log Cake definitely give you the #Chocolategasm feel with you bite into it. 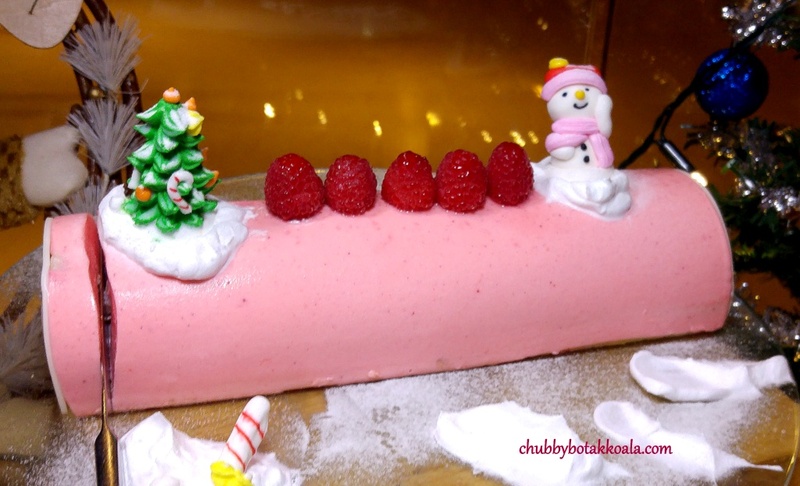 While Pink Champagne Lychee with Petit Marshmallow Yule Log Cake has a delightful lychee flavour, with a texture between moose and marshmallow. 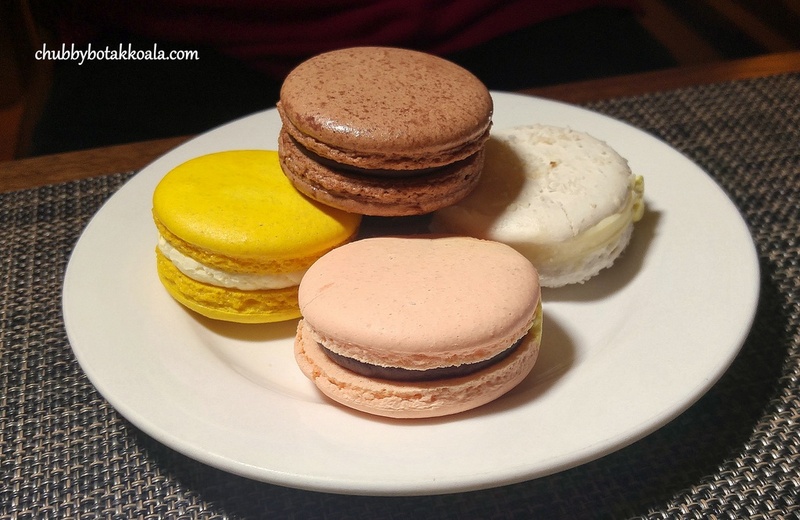 If you still have space after some log cakes, try their Macarons. It was a hit during tasting event, we basically clean sweep the entire range on display. Their unique flavours includes Lemon, Ginger, Coconut, and Blueberry with Salted Caramel. (Excluding Christmas Eve, Christmas Day, New Year's Eve and New Year's Day).